Cub Scouts can get their first taste of Scouting and a chance to go camping in September and October. Scouts and their parents can choose to attend one of six different Cub Scout Launches around the council. There will be archery, BB gun shooting, crafts, games, and more! Each location has an AM and a PM session, so you can pick a time that works best for you. There will be the option to camp out, Saturday night after the Launch. Campouts will include a hotdog cookout, evening campfire with snacks, and a donut breakfast in the morning. Camping is an additional $10 per person and we ask all Cub Scouts have a parent or adult leader attend the sleepover with them. New Scouts will receive a Cub Scout LEGO figurine. The cost for returning Scouts is $10, a LEGO figurine will be included in admission (while supplies last). PLEASE NOTE: All Tigers (1st graders) must have a parent or adult partner attend Launch with them, and ALL Cub Scouts must have a parent or adult partner attend the campout with them. 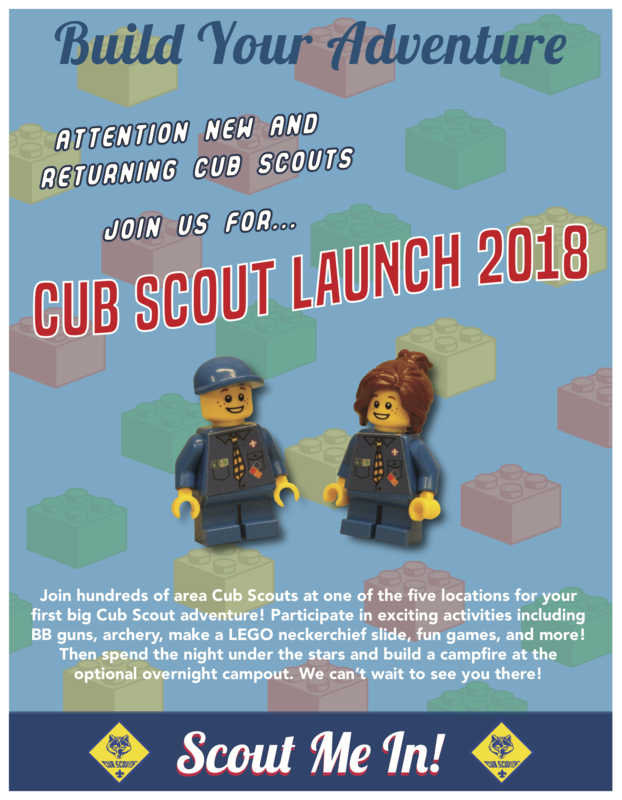 LEGO figurines will be included with the $10 launch admission for RETURNING Scouts (while supplies last).